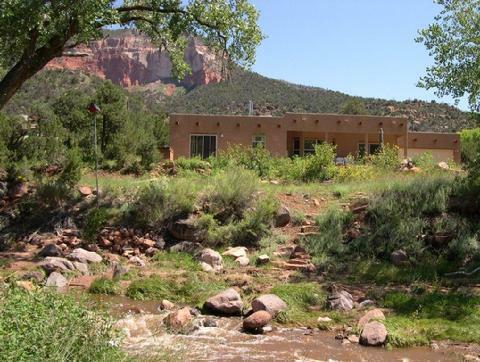 Luxury lodging along the Jemez River, offering privacy and easy access to the main road. When passing through the Jemez Mountain Trail, which is one of the most traveled of the New Mexico Scenic Byways, spend a few days in Jemez Springs and discover the beauty of this lush area rich in native history. Escape the summer heat by visiting New Mexico's high desert oasis. With Summer temperature rarely exceeding 90 degrees, and an average temperature around the 80's. In the winter, you can cross country ski, snow shoe or enjoy the natural hot springs. Autumn bring brilliantly colored foliage and Spring covers the area in wild flowers. Fishing is plentiful from the Jemez River in the back of this vacation house. This 8 year old modern Adoble style home with its picturesque setting framed by Cottonwood trees, is the ideal place visit year round. Come stay at the River House and explore the beauty of the area as seen numerous times in Sunset Magazine. In 2008, the New York Times named Jemez Springs one of the Top 30 places to go this summer and in 2007 the Los Angeles Times called Jemez Springs, the Southwest's little secret.